A cyclone swept south across the country from Saturday 1st. By the time it moved away on Tuesday 4th, more than 40 people had died. Nine people died 10 km south-west of Ōamaru when a flash flood in the Waiareka Stream swept away their houses, while five members of a farming family drowned near Timaru. The wild seas whipped up by the storm claimed 15 lives in all, including nine men drowned when the Fortune was wrecked 15 km south of the Hokianga Harbour. 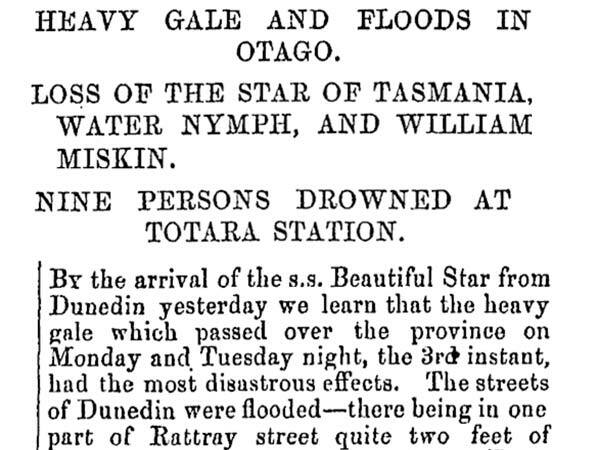 Four died when the Star of Tasmania went ashore at Ōamaru, including two children who drowned in berths where they had been placed for safety. There was also widespread damage to property, with crops washed away and thousands of livestock lost. A contemporary estimate costed the damage at between £500,000 and £1 million ($56–112 million in 2015 values). A memorial to the five Totara Station workers who died in the Waiareka Stream flood was erected in the Ōamaru cemetery. The tragic events inspired Michelanne Foster’s 2008 play, The Great Storm of 1868. We have 14 articles, related to Killer storm sweeps the country.